The redevelopment of the former OfficeScape IV property in Worthington could begin next month, with anchor tenant Central Ohio Urology Group moving in as soon as October. 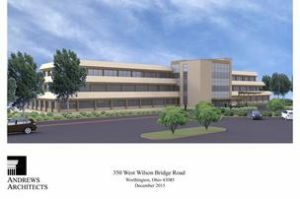 Trivium Development LLC introduced final renovation plans for the 53,200-square-foot building at 350 W. Wilson Bridge Road to Worthington City Council on Monday, and owner Tim Spencer expects to have approval after a second hearing Jan. 19. “It was well received by everyone at (Worthington’s) planning commission, City Council’s excited (and) we’re excited. It’s new Class A office space – that’s not common in Worthington,” Spencer told me. Trivium Development is working to renovate the aging office building at 350 W. Wilson Bridge Road. This new rendering of the Andrews Architects-designed building was presented to Worthington City Council. He said permits will be submitted this month, the budget will be finalized and construction could begin in late February or early March. Spencer said Elford Realty is handling leasing and that no other tenants have been identified for the long-vacant offices. Central Ohio Urology Group last year signed on for 23,000 square feet of medical offices on the ground level. Trivium’s $3.9 million renovation involves gutting the 40-year-old building down to concrete and installing new electrical, plumbing and HVAC systems. New lighting and other energy efficiencies will be added. The project also calls for a new entryway with reconfigured access to the lobby, elevator and stairs. Even the parking lot will be reconfigured and a drop-off area added. It’s an extensive project, Spencer said, but easier than building from the ground up. “That October (move-in) time frame would be impossible except for the shell we’re working with,” he said.